Can anyone tell me why this comment got greyed? Genuine question. Don't want to commit a Jez-crime without knowing what it is! 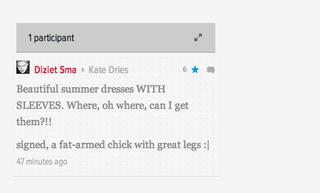 (In case it's not legible, I said: "Beautiful summer dresses WITH SLEEVES. Where, oh where, can I get them?!! signed, a fat-armed chick with great legs :|"